What about chestnuts for breakfast? That’s not a bad idea if the nuts are shelled, diced, candied and added to a loaf of bread. You’ll find chestnut bread in almost every Korean bakery in Los Angeles, because it is so popular in that community. The loaf pictured here came from Manmi bakery on Western Avenue in Koreatown. 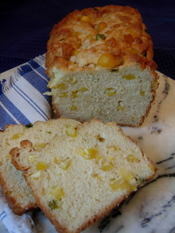 Manmi’s loaf is studded with golden, sweetened chestnut cubes and, for color, a scattering of green dried peas. Knobby in appearance, but light and slightly sweet, it’s wonderful with morning coffee. Chestnut bread is $3.95 a loaf at Manmi Bakery, 869 S. Western Ave., No. 4, Los Angeles, CA 90005. Tel: (213) 389-8844. I have seen tomatoes cause a fit of hysterics. And they were perfectly good tomatoes. As a matter of fact, wonderful tomatoes. This happened in southern India, near Bangalore. It was breakfast time at AyurvedaGram, the ayurvedic spa where I was staying. Most of us ate from the general buffet, a lavish spread of light vegetarian dishes. But some were on special diets related to the health issue that had brought them to the spa. Across from me sat a beautiful young Indian woman, a banker from London with a handsome boyfriend, who called in at the spa occasionally. She was on a diet, for weight loss I imagine. And she had been placed on an all-tomato regimen. This day, they had brought her the wrong tomatoes—either broiled when they should have been raw, or raw when they should have been broiled, I’m not sure. But the outburst was extraordinary. It’s not that she was a nasty person, just that food has strong emotional components.that can be o verwhelming, especially the lack of food considered vital to a desired goal. At any rate, the meals at the spa were so good that I arranged an interview with the chef to get recipes. One of them was for a tomato curry that sounds almost too simple, but when I served it to guests, they wanted more and more. If this curry had been presented to the young banker, perhaps she would have had a better day, and the rest of us would not have been startled out of our morning fog. Heat 1 tablespoon oil in a large saucepan. Add the onions and garlic and cook until tender, 8 to 10 minutes. Add the tomatoes and cook, uncovered, 15 to 20 minutes, or until softened. Meanwhile, heat the remaining 1 teaspoon oil in a small skillet. Add the cumin seeds and cook until a deep brown. When the tomatoes are soft, add the cumin seeds and oil, the ginger root and salt, and simmer, uncovered, 5 minutes longer. Turn into a serving bowl and garnish with chopped cilantro. Makes 2 cups, or 4 side dish servings. Double the recipe to make 6 larger servings, increasing the cooking times slightly if necessary. What a surprise to find fresh prune plums the other day. I had almost forgotten about them, because they have gradually vanished from markets. The reason is obvious: most of the crop winds up dried as prunes. The fresh plums are so different from the dried that it is hard to connect one with the other. A mottled dark purple, they are dusky yellow and dry inside, rather unappetizing to eat as is. But cook them and the y become spectacular, oozing with beautiful scarlet juice and tantalizingly tart in flavor. Prune plums are magnificent in pies, delicious in crisps and kuchens. They appear briefly in the fall, but not in wide distribution. I find them in markets where plum-loving eastern Europeans shop, such as the produce markets on Fairfax Avenue, north of Beverly Boulevard, in Los Angeles. That’s where I bought the batch that ended up in this crisp. I like tart flavor, and prune plums can be very tart if they haven’t softened. For a sweeter dessert, add more sugar to the topping, or sprinkle it on after the crisp is assembled. Even better, add a scoop of vanilla ice cream to each serving for an intriguing blend of warm and cold, sweet and sour. Place the butter, flour and the sugars in a medium bowl and let stand until the butter is softened, then rub together with the fingers to make a soft paste. Preheat the oven to 350 degrees. Arrange the prune plums cut side up in a shallow baking dish. (I use a 10-inch round baking dish with a flat bottom and sides high enough to keep the juices from spilling out). Distribute the butter mixture evenly over the plums. Sprinkle with the cinnamon and additional sugar if wanted, then with the granola. Bake 50 minutes, or until the fruit is juicy and the top is lightly browned. Serve warm. Just try to get a table Friday night at Sahn Maru Korean B.B.Q. in Oakland. My group of seven was relegated to a back room reserved for private parties from the looks of the disc o ball overhead. But we were grateful for any place to sit. I gather it is always this way. Friends who live in Oakland were hunting for good Korean food. When they saw the crowd at Sahn Maru, they tried it out, and now they eat there every Friday. Never mind the wait for a table. The food and the friendly service make up for that. Sahn Maru is located on Oakland’s Kimchi Row, a stretch of Telegraph Avenue that is lined with Korean restaurants and bars, a Korean market, housewares store and community center as well as African restaurants and, next door to Sahn Maru, a Japanese restaurant. Of course the menu features barbecue, because that is what most non-Koreans want. But Sahn Maru has another specialty, black goat. And so we ordered heuk yum so tang, a sizzling hot stone pot filled with goat meat, fragrant sesame leaves and green onions in vibrant orange broth. One of three goat dishes on the menu, it is spicy and strongly gamey, perhaps too gamey for anyone who doesn’t like lamb. But I thought it was delicious. No wonder the restaurant is proud of this dish. There’s no table top barbecuing at Sahn Maru, so our barbecued beef was cooked in the kitchen. Rather than the usual glistening, charred bul gogi, it seemed to have been sautéed, which is what Koreans might do at home, and was a pallid gray. Still, it was flavorful, tender and satisfying. Braised beef in a mild, slightly sweet sauce, another Sahn Maru specialty, came with clear noodles, vegetables and chewy tubular rice cakes, a nice blend of flavors and textures. The restaurant offers a good variety of banchan, the small plates of such things as marinated fish cake, broccoli, eggplant, spicy-sweet marinated radish, bean sprouts and kimchi that accompany Korean meals. So our table was covered with food, including an enormous zucchini and jalapeno pancake on a sizzling flat skillet, rice and barley tea. Afterwards, we were given small white cups of cold, sweet cinnamon-ginger tea with a single pine nut and slice of Korean red date floating on the surface, a refreshing way to end a highly flavored meal. The name Sahn Maru means top of the mountain, according to the menu. Kimchi Row is quite flat, but we did have a summit sort of experience that night as far as the food and the nice feel of the place were concerned. Sahn Maru Korean B.B.Q., 4315 Telegraph Ave., Oakland, CA 94609. Tel. (510) 653-3366. I’ve never seen anyone prepare so many dishes in an hour. But then, professional chefs can do that sort of thing. 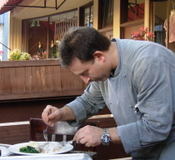 The chef in this case was Michael Smith, who recently relocated to Los Angeles from Baltimore. Tra ined in classical French cuisine, but experienced in anything to do with cooking, Smith offered to organize dinner for six and teach the group how to prepare each dish. Because the guests, including Smith’s wife Lisa, arrived hungry from work, he quickly produced an appetizer--squash blossoms stuffed with ricotta cheese and sour cream, coated with a light batter and fried. These disappeared quickly as we sipped our drinks. Then we gathered around as Smith effortlessly put together three main dishes, two vegetables and a salad, chopping, sautéing, mixing and baking, revealing tricks of the trade and demonstrating knife techniques. He kept things simple rather than intimidating us with showy chef dishes. Because the hostess wanted fish recipes, he walked us through breaded flounder with a lemony butter sauce, blackened cod topped with crayfish tails and salmon with homemade pesto. Meanwhile, he cooked a panful of fingerling potatoes seasoned with homemade stock, garlic and shallots and assembled a yellow squash dish so beautiful it could have been a painting. For the salad, Smith combined his own homegrown arugula with dandelion greens, radishes, teardrop tomatoes and green onions, adding a sweet balsamic dressing to balance the spiciness of the greens and radishes. The effect was rich and meaty, as if the salad had included bacon. And there was still more, an eggplant salad that he brought from home, a high rising loaf of fresh bread and, for dessert, angel food cake with sliced fresh fruit. Aside from the seafood and his homegrown produce, Smith used only top quality farmers market ingredients. Following suit, I dashed off to a farmers market that weekend to collect ingredients for his recipes. 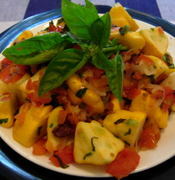 The first I tried was squash provencal, so handsome that it’s on my list of top dishes for dinner parties. Trim the squash and cut in quarters. Cut the shallot in quarters lengthwise, then crosswise in thin slices. Combine the shallot and garlic and set aside. Remove the seeds from the olives. Prepare the tomatoes and set aside. Cut the basil and parsley leaves crosswise in fine slices. Heat the oils in a large skillet over medium high heat. Add the squash and cook 5 minutes, stirring occasionally. Add the shallot and garlic and cook 5 minutes. Add the olives and tomatoes. Season with salt and pepper to taste and cook 3 minutes. Add the basil and parsley and stir to mix. Turn into a serving dish and garnish with basil sprigs. It’s easy to make enchiladas. Just roll tortillas around cheese, pour canned enchilada sauce on top and bake. Well, if you insist. But that’s not the way I do it. 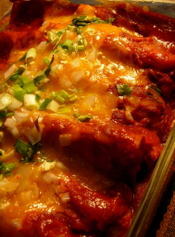 I make enchiladas to enjoy the rich and varied flavors of dried chiles, which a commercial sauce can’t duplicate. The best chiles I have worked with came from Ensenada. Walking along Juarez (5th Street), I came across an open-air shop that displayed the most beautiful chiles I have ever seen. They were freshly dried, soft and silky, unlike older, stiff chiles that crack apart when you handle them. I bought sacks of guajillo and California chiles and made enchiladas with them as soon as I got home. They were wonderful, some of the best I have ever produced. To brighten the color of the sauce, I blended in tomatoes, and I filled the tortillas only with cheese, and not too much of that, because I wanted to emphasize the rich chile flavors of the sauce, not the filling. Enchiladas are forgiving. You can vary the chiles according to taste. New Mexico chiles will add more heat than California chiles, for example. Once I had only dried anchos on hand and no tomatoes. They produced a dark, intense sauce that was very good in its own way. The procedure is easy and not time-consuming. Pressing pureed chiles through a sieve is a bit messy, but that’s the worst of it. The best is enjoying the wonderful aromas as you roast the chiles, grind them and cook the sauce. You can’t get that out of a can. Lightly oil a griddle and heat over moderate heat. When hot, add the California and guajillo chiles and toast lightly. This should take only a few seconds. Be careful not to burn the chiles. Place them in a large saucepan, cover with water and bring to a boil. Remove from heat and let stand until very soft. Drain the chiles, reserving the soaking liquid. There should be at least 2 ½ cups. Remove the stems and seeds and place the chiles in a blender container. On the same griddle, roast the tomatoes, onion quarter and peeled garlic cloves until spotted with brown. Add to the blender. Add the chicken stock base and ½ cup of the reserved chile soaking liquid. Blend until pureed. Pour the sauce into a sieve over a bowl and work through as much of the pureed mixture as possible. Discard the solids. Rinse out the blender with 1 cup reserved soaking liquid and strain into the bowl. Heat 1 tablespoon oil in a medium saucepan. Add the cumin seeds and fry 30 seconds. Stir in the flour and cook, stirring, 1 minute. Add the sauce and the oregano. Season to taste with salt. Bring slowly to a boil, stirring. Remove from heat and set aside. If the sauce becomes too thick, thin with some of the remaining soaking liquid. Heat about 1/3 cup oil in a small skillet. Add the tortillas one at a time and fry on each side until puffy but not crisp. Drain on paper towels. Dip each tortilla in the sauce. Place on a plate and top with some of the cheese and chopped onion. (The green onions are for the topping.) Use about 2 cups cheese for the filling. Reserve the remainder for the topping. Roll up each filled tortilla and place seam side down in a 13x9-inch glass baking dish. When all the enchiladas are rolled, top evenly with the remaining sauce, then with the remaining 1 cup cheese, any remaining onion and the green onions. Bake at 350 degrees 15 minutes, until heated through. 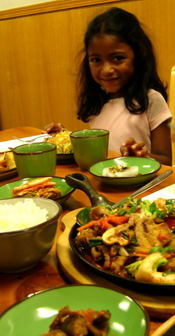 One of our favorite restaurants in the Washington, D.C. area is Taste of Saigon in Rockville, Maryland. It’s an oasis from the drab dining one finds in most suburban areas. Our favorite dishes are the black pepper soft shell crab, which is spectacular, and ca kho to, which is caramel fish in a clay pot. Thank goodness there are two of us, so we can always order both entrees. Surprisingly, we have found that this wonderful Vietnamese restaurant also makes divine mojitos, which are a fantastic accompaniment to the delicious entrees. Get there before 6 p.m. for a good table or make a reservation. In the summer, be sure to ask the servers to seat you in the patio, which is complete with a koi pond, flowering plants and live bamboo. –Teresa and Scott, New Market, Maryland. Taste of Saigon, 410 Hungerford Drive, Rockville, MD 20850. Tel: (301) 424-7222. I love pasta, and I’ll even eat it for dessert, as long as I am at Cafe Bella Roma SPQR, a new Italian place on Robertson Boulevard in Los Angeles. Chef/owner Roberto Amico has come up with spaghetti freddi, a sweet version of spaghetti with marinara sauce. It’s so fragile that he comes to the table to prepare it himself. 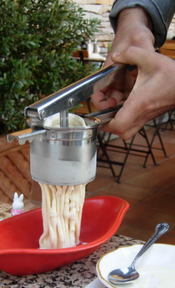 Amico presses vanilla gelato through a potato ricer to make long spaghetti like strands. For marinara, he spoons on raspberry sauce and then sprinkles the sauce with grated white chocolate. That’s the Parmesan. The spaghetti softens at once--forget about al dente--but it’s still delicious. Amico’s other pastas are all right too. Tagliatelle risorgimento harks back to his first restaurant job at a café in the Piazza Risorgimento in Rome. It’s a mild combination of prosicutto, peas and mushrooms in a red wine and cream sauce tossed with tagliagelle that Amico makes himself. One night, just after the restaurant opened in June, I had delicious penne portofino, with salmon, shallots and white wine in a light pink sauce. And I loved the subtle taste of the sea in spaghetti ai frutti di mare, with clams, mussels, shrimp and scallops in marinara sauce. Linguine Bella Roma, with shrimp, clams, mussels and porcini mushrooms, was just as good. One night, Amico cooked for my table twice, first boning a whole branzino (European seabass) which was wonderfully moist and tender, then returning for spaghetti freddi. You can’t eat at the café without meeting him, because he often circulates among the diners. Most of the tables are outside on a terrace walled off from the sidewalk. Sirens from a nearby fire station scream occasionally, but after they pass, you can return to the illusion that you are in a charming neighborhood café somewhere in Italy. 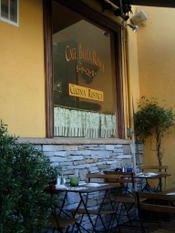 Café Bella Roma SPQR (these initials appear on the Roman coat of arms), 1513 S. Robertson Blvd., Los Angeles, CA 90035. (310) 277-7662.Open Tuesday through Sunday for breakfast, lunch and dinner. Closed Monday. When I fly to Orlando to visit my brother and his family, I may be the only passenger on my American Airlines flight thinking about a pig and not a mouse. We discovered Oasis Cuban Cafe about five years ago; it looked out of place on busy four-lane Ronald Reagan Blvd. in Longwood. A plain Cuban country diner on a stretch of road that has become home to block upon block of chain restaurants and mini-malls and tire shops. Now, Oasis is my Stop No. 1 when I visit central Florida. The food is fresh, flavorful and simple. At this point, we've pretty much eaten through the menu, which is universally tasty and reasonably priced (my niece Ali likes the football-sized potato croquette appetizers). But most of the family keeps returning to the pork category, to our favorite dish, Lechon Asado--roast pork. This is meat at its simplest: slow-roasted with garlic, onion and spice. For a while we were disappointed after Oasis upgraded to a better cut of pig--that "other white meat," which tends to be leaner but less flavorful. Fellow customers must have had similar concerns, because the fattier, less perfect pork has returned. I prefer the long-cooked, nearly carmelized bits and pieces that come heaped with onion and garlic. 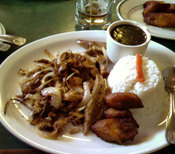 Perfect on its own, the meat is accompanied by white rice, good beans and meduros--savory fried plantains (another favorite). After a breathtaking drive up and down steep hills and around vineyards in Chile’s Casablanca Valley, it was a relief to sit down to a quiet wine tasting and lunch at the House of Morande. This soaring wooden structure on the highway from Santiago to the coast showcases Vina Morande wines and Chilean food. It is shaped to resemble a grape, certainly the largest grape I have seen, and the windows in the back wall are formed of wine casks. We began by dipping bread into Morande’s limited edition extra virgin organic olive oil. The oil was sprinkled with merquen, a smoked red chile seasoning produced by the indigenous Mapuches. A crisp, fruity Terrarum Sauvignon Blanc accompanied an appetizer plate of Edam and Camembert cheeses, olives, walnuts, roast beef and fried Thai style meatballs enclosed in a golden net and placed on baby corn—yes, Thai fusion in Chile. Seafood dominated the menu, starting with cream of clam soup with artichoke hearts. I noticed a subtle asparagus note in the nose of the Gran Reserva Chardonnay that accompanied this course. We drank a limited edition organic Pinot Noir with a salad composed of chewy bits of grilled octopus sprinkled over crisp pastry placed on top of diced tomatoes, red onion and green pepper. The wine opened as it stood to reveal intense berry flavors, and we continued to drink it with seared Easter Island tuna. For dessert, we sampled almost every sweet in the kitchen, including a Pinot Noir sorbet, cake topped with whipped cream sweetened with manjar (the Chilean version of dulce de leche), a chocolate cupcake filled with melted chocolate, a lacy pastry tube oozing lemon cream, and a bowl of huesillo risotto, a soft rice pudding that contained dried peaches cooked in syrup. The wine was a limited edition Golden Harvest Sauvignon Blanc, made from naturally botrytised grapes grown in the Casablanca Valley. Even herbed tea was too much to drink after this enormous repast, and it was a relief to relax as we drove back to Santiago on a highway that seemed very smooth after our rough ride earlier in the day. 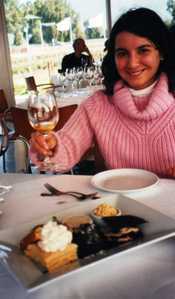 The House of Morande is located at Kilometer 61 on Highway 88, the route from Santiago to Vina del Mar on the coast.